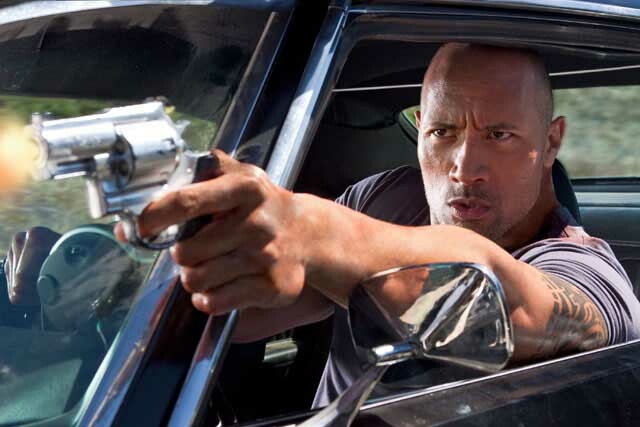 Dwayne "The Rock" Johnson aims for revenge in Faster. Not long before Faster, Dwayne “The Rock” Johnson (The Other Guys) appeared to be sliding down the slippery slope of self-parody with funnyman turns in Tooth Fairy, The Other Guys and Race to Witch Mountain. But with Faster, a violent, hard-nosed movie about retribution and forgiveness, he has jerked the wheel firmly back in the direction of an action star. Looking massively imposing in a Schwarzenegger-esque build and moving with much more baleful deliberation than the film’s title would imply, Johnson plays an unnamed ex-con fresh out of prison on the straightforward errand of killing several men involved in a robbery that cost his brother’s life a decade prior. The movie has two side plots as well, involving Billy Bob Thornton (Bad Santa) as a detective trying to put his life back together and Oliver Jackson-Cohen (Going the Distance) as a multi-millionaire hit man hankering for a worthwhile target. Carla Gugino (Women in Trouble) returns to the type of role she played in Sin City and Watchmen, a pragmatic woman of the law. Although the supposedly clever twist ending does nothing to elevate this film, the theme of pulling oneself back from the precipice of nihilism and violence that runs through all three main plots is surprisingly well articulated for a movie of this sort. The biggest qualm I have, is that we’re given no opportunity to see if “The Rock” really can act in a serious dramatic role. He only says about twenty words in the whole film, and none of the gunfights or confrontations seem to present his superhuman character with any challenge that might heighten the tension. All in all though, Faster forgoes machine guns, stunts and hot babes for the most part in favor of a well-developed and gritty revenge shooter. Of the few special features included in the DVD edition, most notable is an even nuttier alternate ending, which is introduced by the director. The extended scene is actually one of the biggest action sequences in the film (make that not in the film) and, yes, it would alter the wrap-up in a substantial way. According to director George Tillman Jr. (Notorious), it didn’t go over well with test audiences and was axed. The Blu-ray package offers a few more extras, including two featurettes: one about the cast and another on the film’s gunplay and high-speed car hijinks. I have enjoyed this movie. It is not too fast paced and it is not action for the sake of action. There was one scene that disappointed me. It was the bathroom fight scene. I’ve been wanting to check this one out. What didn’t you like about the bathroom fight scene, Moses?